Just in time for the back-to-school season, new laptops with extended battery life are hitting store shelves. 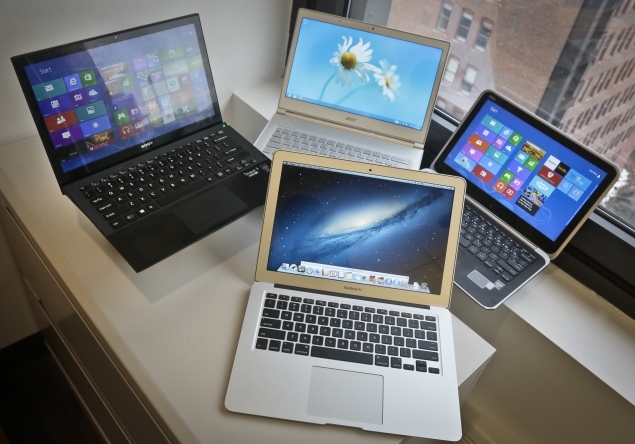 What these laptops have in common are microprocessors that belong to a new family of Intel chips called Haswell. The chips consume less power than previous generations and promise a 50 percent boost in battery life for watching video. The improvements extend to word processing, Web surfing and other computing tasks as well. Put another way, you can unplug your laptop in the morning and go a full day without a charge, with some breaks for meals, exercise and errands. The 13-inch (33-centimeter) MacBook Air, for instance, promises up to 12 hours of battery life. Three Windows machines I tried promise seven to nine hours. For students, that's a full day of cutting classes - and more. For business travelers, that's a cross-country flight including delays. Slim, lightweight laptops with Haswell chips cost more than $1,000. Cheaper laptops will be heavier or come with older chips. 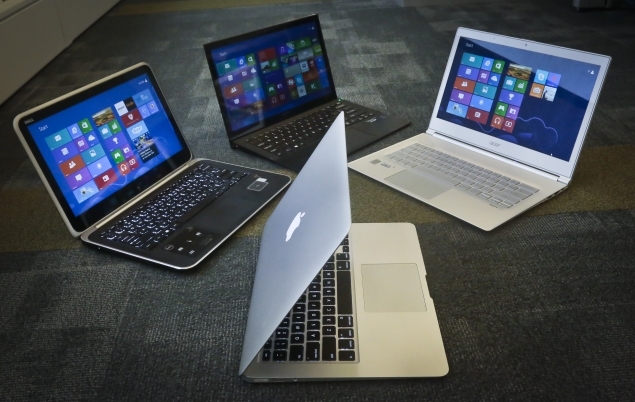 I reviewed Apple's MacBook Air and Dell, Sony and Acer computers running Microsoft's Windows 8. Samsung and other PC makers are just coming out with Haswell laptops, so you should expect even more choices by the holidays. The four I tested use solid-state flash drives, which keep laptops light but don't have as much capacity as traditional storage. They also lack Ethernet ports for wired Internet connections and slots for DVDs. Expect to use Wi-Fi a lot, though USB ports are available to connect devices. Base models come with 128 gigabytes of storage. You can spend a few hundred dollars more for additional storage and faster processors. With a screen measuring 13.3 inches (33 centimeters) diagonally, the larger model weighs 2.96 pounds (1.34 kilograms) and costs $1,099. An even lighter, 11.6-inch (29.5-centimeter) version is available for $999, but promised battery life is just nine hours. Spend the extra $100 for three additional hours and a larger screen if you can afford it. It's odd that the Air is the cheapest of the four I reviewed, as Apple's computers are traditionally pricier than their Windows counterparts. But in this case, the Windows laptops I tested all come with touch screens, something Apple has avoided in laptops on the premise that people don't want to lift their hands off the keyboard to use touch controls. The base model of the Air also has a slightly slower processor - at 1.3 gigahertz, compared with 1.6 gigahertz for the three Windows laptops. Although promised battery life on the 13-inch review unit was 12 hours, I was able to get more than 14 hours once by turning off the Wi-Fi connection. I typically got nine to 11 hours for general Web surfing. Apple promises up to 10 hours for playing video downloaded from its iTunes store. I ran that test four times and got nine to 10 hours of playing the same episode of "Revenge" over and over. As with other laptops, performance drops significantly when streaming video over Wi-Fi, down to six to seven hours of Hulu. Beyond having a long battery life, the Air is a solid machine that is easy to hold and carry. Although its aluminum exterior is easy to scratch and dent, I feel comfortable banging it around in my backpack because it has few moving parts that might be susceptible to damage. I even ran four miles home with it once. Only the 13-inch model has a slot for SD memory cards. Apart from its limited storage compared with laptops with regular hard drives, the MacBook Air will work fine as a primary computer. However, if you need an even more powerful laptop, see if Apple will update its MacBook Pros with Haswell this fall. The XPS 12 is part of a category called ultrabooks - slim and light laptops, much like MacBook Airs, except they run Windows. The XPS 12 is also a convertible. The screen spins like a pig roasting on a spit. In one position, you get a laptop. Spin it 180 degrees, close the lid, and you have yourself a tablet. Magic. Unfortunately, the XPS 12 is on the heavy side. The base model is 3.35 pounds. On paper, it's less than a half-pound heavier than the Air. But in practice, it feels heavy - especially as a tablet, at more than double the 1.44 pounds for the full-size iPad. The XPS 12 is alone in lacking an SD card slot, and its 12.5-inch screen is the smallest. But it is also the only one to have physical volume buttons on the side, and it's more affordable than the other two Windows laptops I reviewed. Promised battery life is about 8.75 hours. I got nearly 8.5 hours for word processing, spreadsheets and other tasks that didn't need Wi-Fi. With wireless turned on, I got 7.5 to eight hours of use. Like the other two Windows machines, I got five to six hours of iTunes video. That's about half of what I got on the Air, but Apple has the advantage in being able to optimize its hardware for the software it also designs. I got about 5.5 to six hours of streaming video on Hulu, which is just about an hour less than what I got on the Air. I did have some trouble with the battery losing its charge quickly when not in use, but a software update seems to have fixed that. That said, the XPS 12 took up to four hours to get a full charge, compared with two hours or less for the others. What I like most about the XPS 12 is the fact that it automatically disables the on-screen keyboard when in laptop mode. On the Acer and the Sony laptops, the touch keyboard gets in the way when you already have a fully functioning keyboard attached. Tablet computers need that keyboard, so it comes back automatically when you flip the screen into a tablet. It's a smart strategy that I wish all other Windows 8 computers would adopt. The Pro is an ultrabook that's light. Very, very light. The 13.3-inch (33.8-centimeter) laptop weighs just 2.34 pounds (1.06 kilograms), only 60 percent more than an iPad. Sony uses carbon fiber to keep it light. It feels to me like cheap plastic that's about to break because it bends. But Sony assures me that it's more durable than aluminum. And Sony says the fact that it bends isn't a sign of weakness but a characteristic that lets it absorb shock. The base model starts at $1,250, though you can save $100 with an 11.6-inch (29.5-centimeter) Vaio Pro 11 instead. I was ready to hate the Pro 13 because the cursor keeps jumping around when I type, making it difficult to complete sentences. But I tried three machines without problems at a Sony store in New York. Turns out I had to download a piece of software to give me settings for touchpad sensitivity. I had two weeks of frustrations until then, though Sony tells me most consumers won't need the separate download. Once that got fixed, the laptop worked fine. The laptop hinge serves as a kickstand when open to prop up the keyboard, making it slightly easier to type. I consistently got more than the seven hours of battery life promised for general Web surfing and word processing. I reached 8.5 hours once with Wi-Fi turned off. Battery life drops below six hours, though, for iTunes video download and Hulu streaming. If you do a lot of that, you can add a spare battery for $150, doubling the battery life. The system is still less than 3 pounds with the spare battery attached. The other units I tried won't let you replace batteries or insert a spare at all. The Aspire has what I want in a laptop, except for the price. The laptop's aluminum body is covered on one side with glossy white glass. It reminds me of a refrigerator, but I came to appreciate the durability it brings once I started lugging it around. It's also fairly light, at 2.87 pounds (1.3 kilograms). You can flip its screen all the way back so that both the keyboard and the screen are level with the surface, just like a tablet on a tabletop. I can't think of any scenarios in which I would need that, though Acer says it's good for presentations. Just press Function-O on the keyboard and the image on the screen rotates 90 degrees at a time, allowing you to show something to others sitting at your table. Acer's website promises eight hours of battery life. I exceeded nine hours with Wi-Fi off and got seven to 8.5 hours of general Web surfing. But I got less than six hours of iTunes video and Hulu streaming. Two complaints about the design: The power button is near the hole for the charger, so I accidentally turned the machine off by mistake several times. Acer also places the "page up" and "page down" keys next to the arrows to move the cursor. So instead of moving the cursor one line up, I've often moved it a whole page up or down and lost my train of thought. I also had the cursor jump around when I first used it. A replacement unit Acer sent me to review worked without a hitch. I eventually noticed the first machine had the touchpad-sensitivity settings missing, even after resetting the unit to factory conditions and downloading new software for the touchpad. My advice is to check return policies in case you run into trouble. The MacBook Air worked well out of the box, but the three Windows machine all required software adjustments. If you want a touch screen, you'll need to go with Windows 8. Whatever you choose, these are all great machines that will give you several hours of use on a single charge - as long as you can afford them.